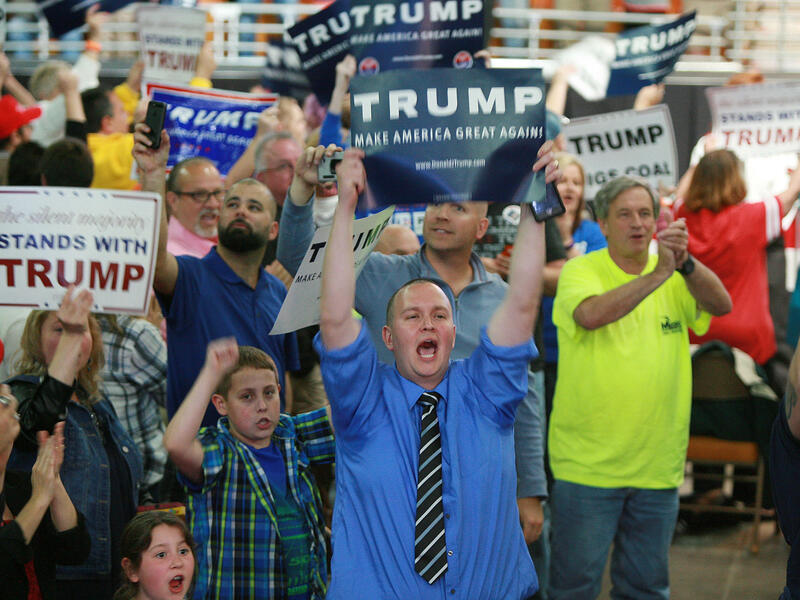 Supporters of Republican presidential candidate Donald Trump shout at the media prior to a rally at the Charleston Civic Center on May 5 in Charleston, W.Va. Ahead of our forthcoming podcast, I've been heads-down in some reading and interviews about the way we talk about, well, white people. Whiteness has always been a central dynamic of American cultural and political life, though we don't tend to talk about it as such. But this election cycle is making it much harder to avoid discussions of white racial grievance and identity politics when, for instance, Donald Trump's only viable pathway to the White House is to essentially win all of the white dudes. And indeed, the roiling civil war between the Republican Party's elites and a huge swath of its base has prompted an unusually candid public grappling with whiteness. Take this paragraph from a post by Bloomberg's Sasha Issenberg on "Hillary Clinton's Appalachian Problem:"
"This is all a reminder of how circumstantial Clinton's position as tribune of the white working class was during her first presidential campaign. (Thought exercises: what would Clinton's 2008 coalition have looked like had it been John Edwards, not Obama, who had won the Iowa caucuses that year? And what would it look this year if her liberal challenger were Deval Patrick instead of Sanders?) Perhaps now that she is no longer running against an African-American candidate—and has anointed herself a crusader against the 'challenges of racism, of sexism, of discrimination against the LGBT community'—Clinton no longer has much of a connection with those 'hard-working Americans.' "
This is much closer to Saying The Thing than we normally get, an acknowledgment that the reason "hard-working Americans" — the quotes underscoring the euphemism — don't really rock with Hillary Clinton is a sense that some of the concerns she's championing are, if not anathema to them, then at least not theirs. And that this time around, there isn't a black candidate to ensure that some white voters will vote for her, however grudgingly, despite her platform. "Most voters don't follow politics and policy for a living, and it's understandable that they would often fall for arguments based on faulty numbers or a misreading of history. ... As low as my estimation of the intelligence of the Republican electorate may be, I did not think enough of them would be dumb enough to buy his act. And, yes, I do believe that to watch Donald Trump and see a qualified and plausible president, you probably have some kind of mental shortcoming. As many fellow Republicans have pointed out, Donald Trump is a con man. What I failed to realize — and, I believe, what so many others failed to realize, though they have reasons not to say so — is just how easily so many Republicans are duped." It's telling that Chait finds it easier to imagine that huge swaths of Republican primary voters are childlike and naive, rather than folks who quite rationally dig Trump's direct appeals to their interests — their racial interests. Among Trump's most notorious policy proposals is a moratorium on Muslims entering the country. He has called Mexican immigrants "rapists." Maybe we should concede that these declarations are not incidental to his appeal among his supporters, but central to them. Calling them "idiots" posits that they've been duped, when perhaps Trump is saying precisely what they want to hear. When Trump's supporters aren't being written off as intellectually incapable of knowing a huckster when they see one, their motivations are often ascribed to their being "working class." But the working class today is nearly 40 percent people of color — and among people of color, Trump is profoundly unpopular. His coalition is nearly entirely white. Even the class part of the "working class" narrative is inaccurate; Trump's supporters are wealthier than most Americans, and have higher incomes than supporters of Hillary Clinton and Bernie Sanders. The "working class revolt" explanation for Trump's rise is overstated — and it can be a useful dodge to avoid talking about explanations involving racial grievance. There have been outlets and pundits this election cycle who've shown they're willing and able to dig into the role that racial grievance plays in How Trump Happened. Others haven't, and continue not to. And that's a problem. When we don't grapple with whiteness in our politics directly and explicitly — to talk about the fact that not-insignificant numbers of white voters are motivated more by identity politics than by ideology or faith — we're essentially agreeing to misidentify some of the most important dynamics of this cycle.